For years the Pasta & Company store located in Seattle's University Village has posted a featured Soup of the Day on a chalkboard outside its entrance. Off and on I've wondered what their carrot soup tasted like, but I've never actually tried it. Was it Carrot Ginger Soup? Carrot Cilantro Soup? Carrot Curry Soup? It always sounded intriguing, but I guess not quite tempting enough. RL isn't fond of doesn't eat hates cooked carrots, so that may have been a factor. But today, with pounds of carrots in the fridge and RL away for the day, it was time for me to play with a carrot soup of my own. Finding a ton of recipes in cookbooks and online for reference, I chose ingredients I enjoy that might play nicely together. Here's a photo of the cast of characters, all ordinary pantry items found in most kitchens. 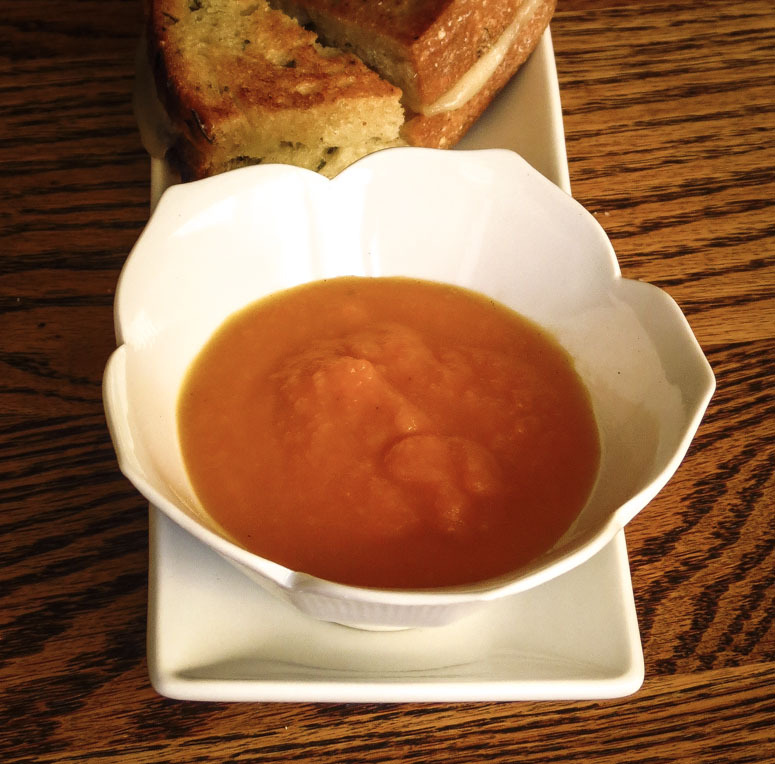 That chunk of bread, rosemary olive oil sourdough, was initially intended for toasted croutons to accompany the soup. Sudden hunger pangs caused me to change the plan and make a toasted cheese sandwich instead. You can see a few remaining wedges in the photo at the bottom. Step 3 in the recipe makes it look like you are preparing baby food, a totally unappealing puree, but press on. The soup soon improves in both taste and appearance. This was a perfect light lunch today, tasty and filling but not too heavy. (The missing other half of the sandwich doesn't really count as lunch; it was an emergency late-morning snack consumed long before the soup was ready.) RL might not love carrot soup, preferring something without cooked carrots, a chunkier soup, one more robust with spicy flavors, but today that wasn't an issue. He wasn't home for lunch so he didn't get to vote. Onions, carrots, ginger and an orange accounted for the subtle layers of flavor. The orange juice and grated zest offered a citrusy note to balance the mild sweetness of the onions and carrots. A warm bowl of soup benefitted from the slight sour tang of lime juice added at the end. Chilled, the soup was delicious with sour cream and a bit of cumin stirred in to finish. Shredded mint or cilantro also merit a future taste test as optional toppings. Carrot Soup might not make our regular soup rotation, but it worked well for lunch and could be a simple first course for a multi-course dinner. I wonder how it compares to the Pasta & Co version that I've never tasted. Melt the butter in a pot over low heat. Add the onions and ginge, cover and cook until tender but not caramelized, about 25 minutes. Add the carrots and broth and bring to a boil. 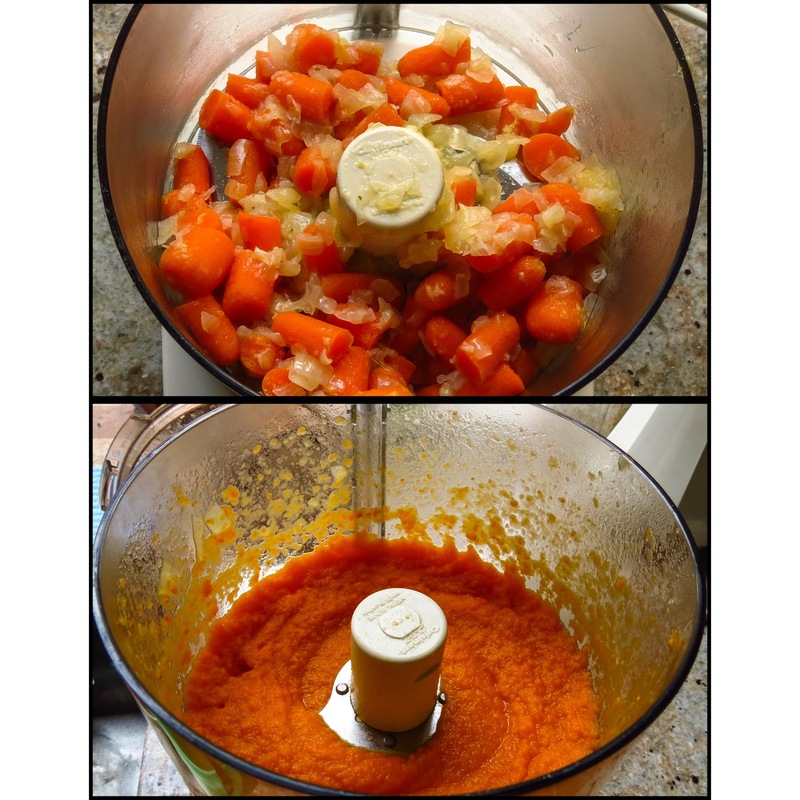 Reduce the heat and simmer, covered, until carrots are quite tender, about 25 minutes. Use a strainer to separate out the solids; retain the broth, you'll use it soon. Remove the coins of ginger and discard. Put the solids into the bowl of a food processor fitted with a steel blade. Add 1 cup of the cooking broth and process until smoothly pureed. Put the puree back into the cooking pot; add the orange juice and 1 to 1.5 cups of additional stock until the soup is the desired consistency. Taste and adjust seasoning with salt and pepper. Add the orange zest and simmer until the soup is heated through. Serve immediately, OR chill and serve cold (in which case use olive oil instead of butter in Step 1). Optional Toppings: swirl in a squirt of lime juice, or add a dollop of sour cream, or dust with a sprinkle of cumin or a scattering of fresh mint shreds. 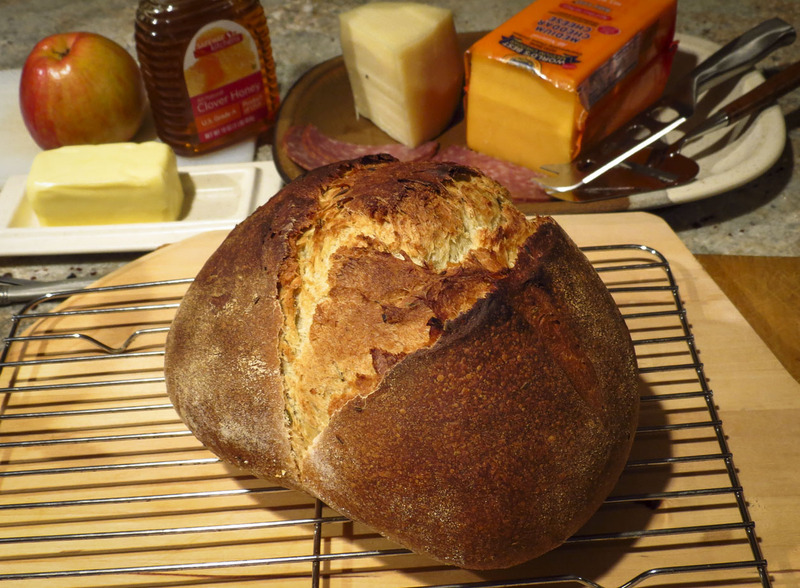 Today was Bread Day, a day to try a new recipe and get serious about sourdough again. My starter had been sulking lately, putting out a few puny bubbles after its weekly feeding instead of expanding enthusiastically. So I gave it a pep talk, fed it three and four times a day for several days, and brought it out of its slump. A well-fed starter is a happy, active starter, and I've been altogether too casual about feeding mine recently. Hey, I've been quite casual about bread making in general for years without any problems. If "Cooking is an art and Baking is a science", then either baking bread is an exception, or I have just been very lucky. Today I decided to give precision a try. I read through the entire sourdough section in the hefty King Arthur Baking Cookbook, paying careful attention to various cautions about weighing vs. measuring, folding vs. kneading, steamy vs. dry oven baking. Weighing the flour and sourdough starter gave me an excuse to break out some underused kitchen tools. 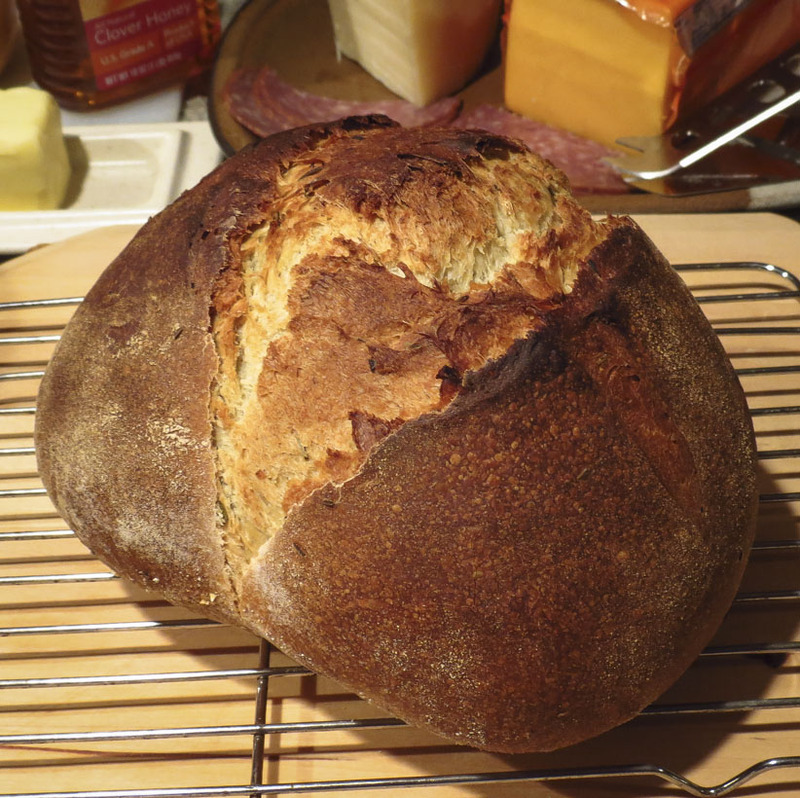 The new recipe promised to yield a hefty 3-pound boule, or two 1.5-pound loaves. That's a lot of bread for two people. 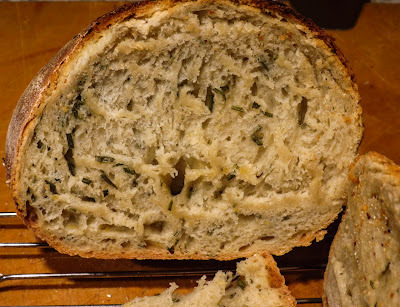 Cautiously opting for a half recipe to see if we liked this sourdough version, I followed the recipe faithfully, step by step, right up to the final addition of salt and rosemary. 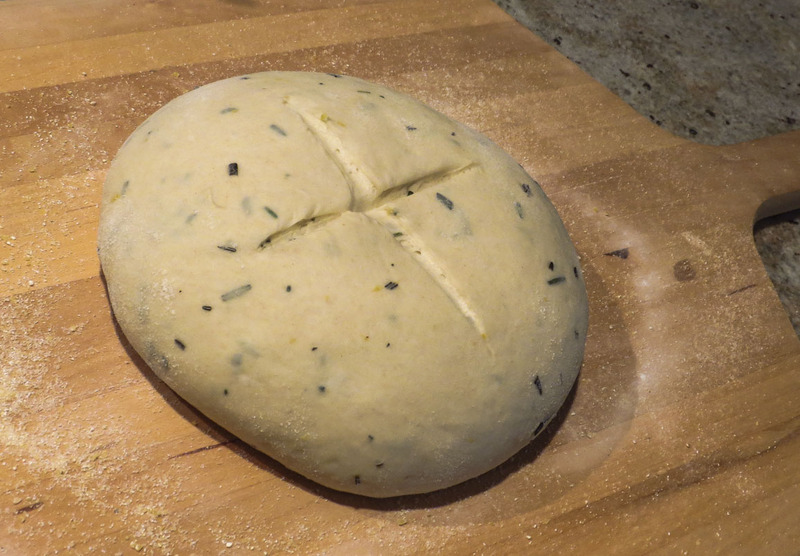 The rosemary whispered to me, "send in some lemon zest! ", so I did. The dough mass was a bit sticky, but not excessively so. It was easy to knead without adding any extra flour, not always the case in my experience. I don't own any fancy proofing bowls or baskets, but a lightly-floured tea towel and medium size round-bottomed mixing bowl created a fine substitute. The scoring of the top looked fine before baking, but turned out to vary in depth and distort the finished baked crust. Okay, no awards for appearance. The recommended times for resting/fermenting/rising worked out as written. My oven may run a little hot, because the bread was finished in 35 minutes rather than the predicted 40. Checking the temperature with a thermometer took any guess work out of the process. It finished at 200F exactly with a browned crust and fully-baked interior. The crust was firm with a crackly flake and crunchy bite. The interior was soft with a light, open crumb. A pronounced rosemary flavor was noticeable, yet pleasant while the lemon zest faded away, far into the background, barely discernible. That lack of lemon tang disappointed the cook, but no one else knew of its presence or missed the flavor. Dinner tonight was fresh bread with lemon butter or honey, Manchego cheese, sliced meats and Honeycrisp apple wedges. Mmmmm, good eats. Put the flour in a large mixing bowl. Add the water and olive oil to the starter and stir the mix into the flour. Mix by hand for 2 minutes, until the flour in completely incorporated but the dough is not yet smooth. 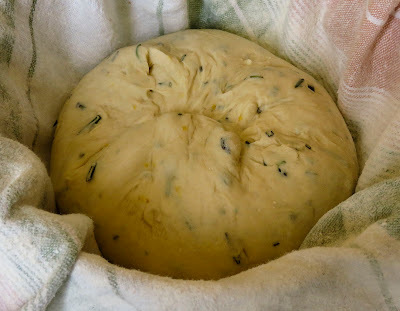 Gather the dough into a ball, cover loosely with a cloth, and let rest for 30 minutes. Add the salt and knead dough until it becomes smooth and only slightly tacky. (This took about 7 minutes; I wasn't very energetic.) Sprinkle the rosemary and lemon zest on top and gently knead to evenly distribute these additions throughout the dough ball. Avoid adding any additional flour; the dough should be a bit tacky and soft, not firm. 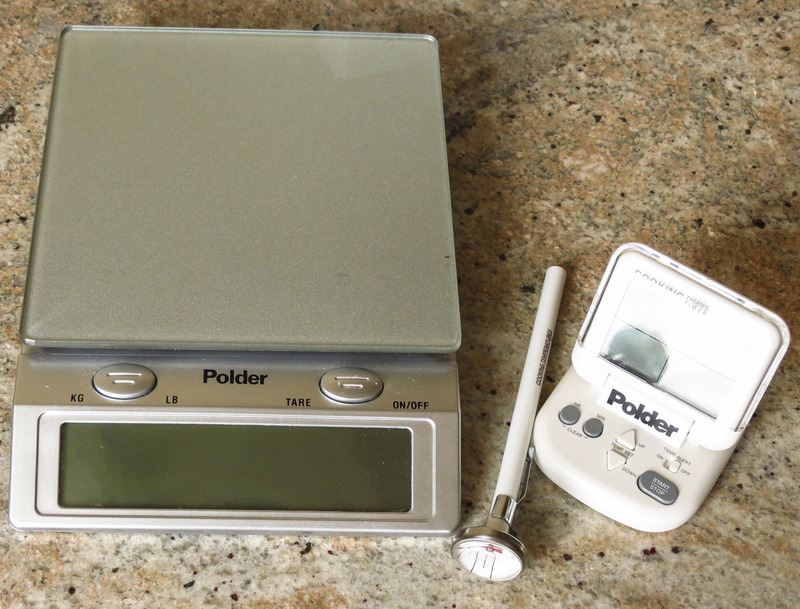 Use a thermometer and check the dough's temperature; it should be roughtly 78F to 80F. (What do you do if it isn't in that range? knead it some more, perhaps?) Return the dough to the bowl, cover lightly with a tea towel and let it rest and ferment for 2 hours. After the first hour, fold it once (all 4 sides folded and overlapped,envelope-style). Pick up the dough and roll the edges under, forming a loose ball; place the bottom (the seam-side) up on a lightly-floured surface. 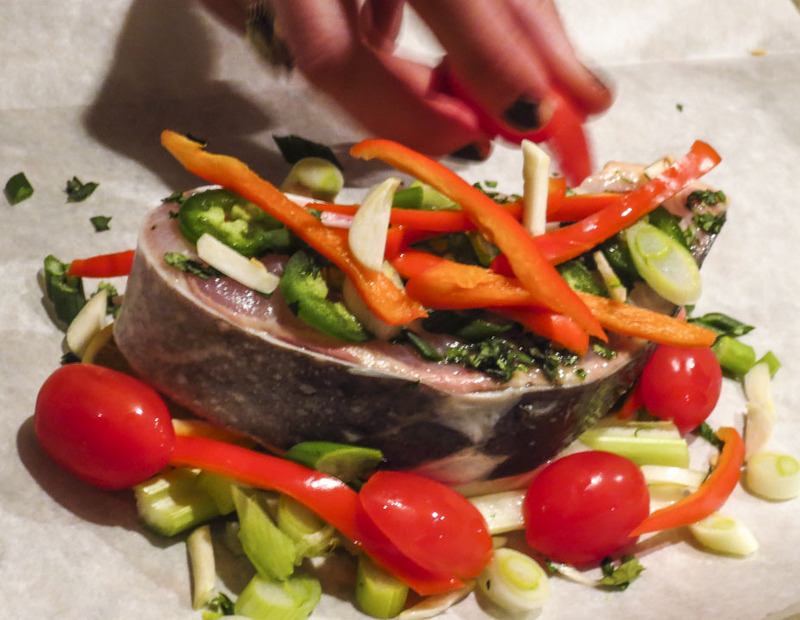 Cover loosely with a tea towel and let it rest for 20 minutes. One hour before baking, preheat the oven and baking stone to 450F. Place a cast iron pan on the shelf below the baking stone. When ready to bake, turn the loaf onto parchment paper set on a baker's peel, or a semolina-dusted peel, and score with a razor or sharp knife. Slide onto the baking stone and pour water into the cast iron pan to fill the oven with steam. Bake at 450F for about 40 minutes, opening the oven door to remove the cast iron pan and let out the steam after 20 minutes. (I baked 20 min, removed the pan of water and baked 15 minutes more: the bread was done!) 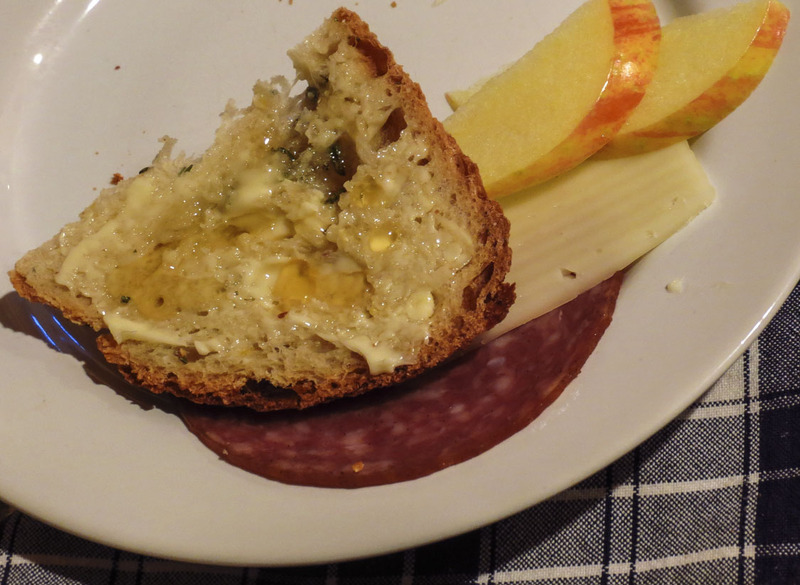 When the bread is ready, the crust will be richly colored. Use an insta-read thermometer to check the temperature of the loaf: he internal temperature should be about 200F. ...a Pepper Jack and Yogurt Version. 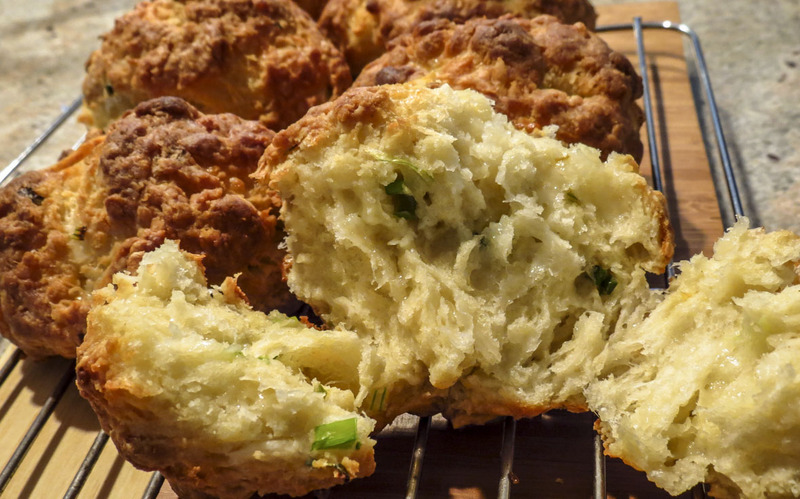 Biscuits, mmmmmm, mmmmmm, who can resist a warm, fragrant, fresh-from-the-oven biscuit? Not me, especially if there's a spot of honey or pepper jelly to drizzle over each split half. Some biscuits are quite refined, rolled and folded flakey poufs, fancy ladies-lunch biscuits, proper little sweet cream numbers that are meant to be served in baskets lined with linen-napkins. 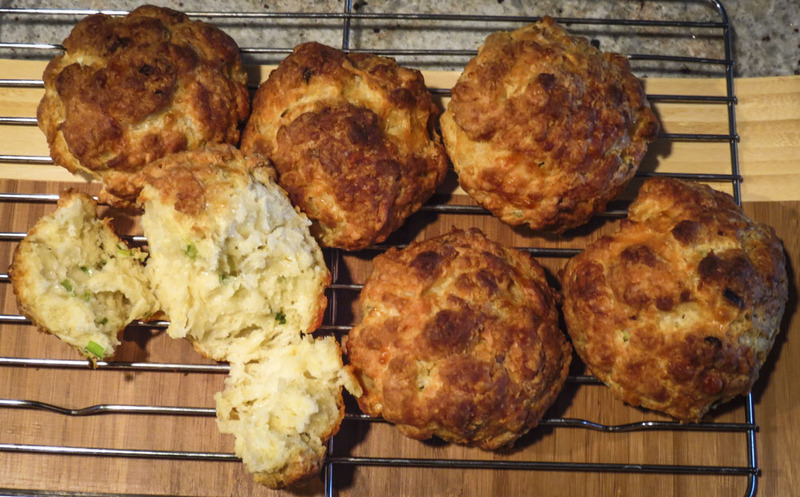 I think generations of Southern cooks must have a special DNA strand that enables them to make perfect flakey biscuits effortlessly. 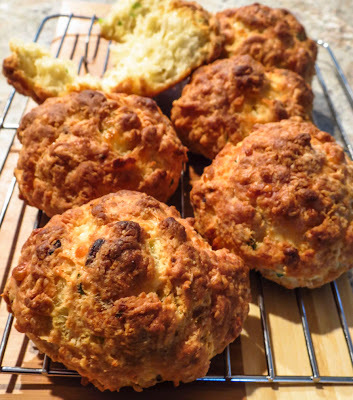 Cheese and Chive Biscuits are delicious all by themselves, or plan to serve them split open and filled for sandwiches. 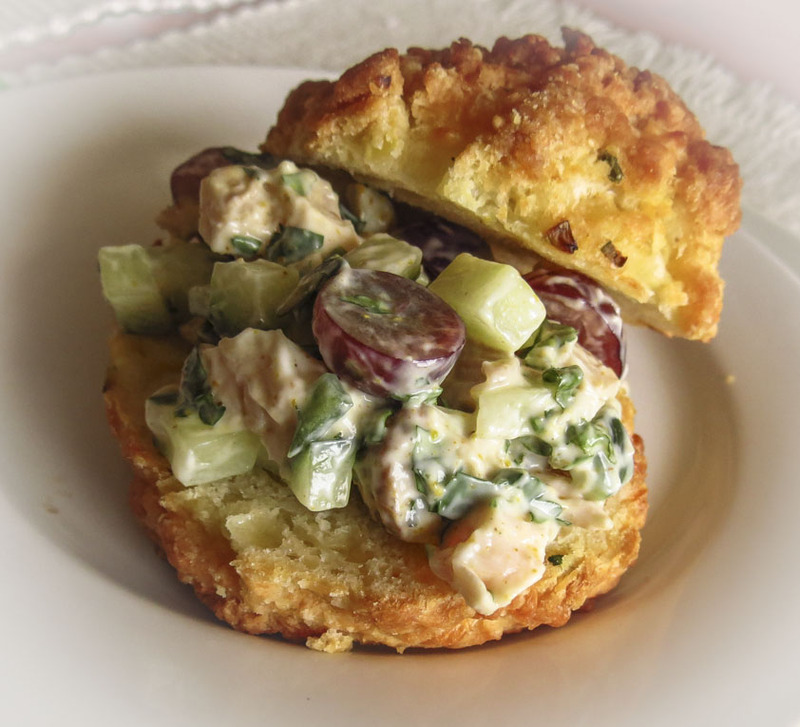 Try one with your favorite chicken salad, or piled with thinly sliced ham, a slather of Dijon and a lettuce leaf. Pair one with scrambled eggs and bacon for breakfast, or add some crumbled bacon to the batter for Bacon, Cheese and Chive Biscuits. Oh my, I'm getting hungry just thinking about even more possibilities. Why use yogurt? The original Bon Appetit recipe called for 8 ounces of buttermilk, but I didn't have any on hand. The Greek yogurt and milk combination worked out so well as a substitute that I'll continue to use yogurt in future batches. I always have yogurt in the refrigerator, not so much any buttermilk. Position an oven rack just above center of oven and preheat to 425°F. Line heavy large baking sheet with parchment paper or a silpat. Combine flour, baking powder, baking soda, and salt in food processor; blend 5 seconds. Add butter cubes and blend until coarse meal forms, about 30 seconds. Transfer flour mixture to a large bowl. Add cheese and fresh chives; toss to blend. Gradually add yogurt and milk, stirring to moisten evenly (batter will feel quite sticky). Using lightly floured hands, pat dough into balls, OR use generous 1/3 cup batter for each biscuit, and drop onto prepared baking sheet, spacing about 2 inches apart. Serve biscuits warm or at room temperature with honey, if desired. Cook's Note: Today's batch used Greek God's honey yogurt and added 1/4 cup of mint to the dough. These biscuits were super delicious split and drizzled with honey! No, I don't think I'll pair them with sausage gravy or chili. 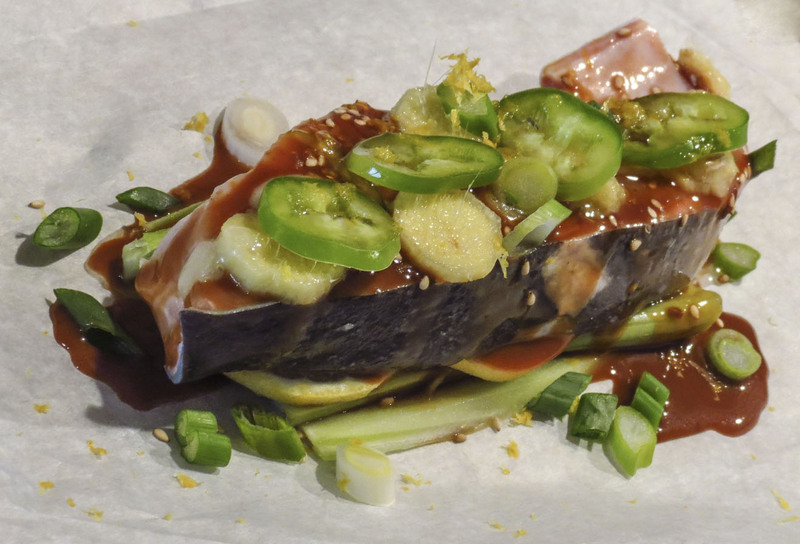 Tuesday's impromptu fish dinner began with an unscheduled stop at Mutual Fish. Unscheduled? Oops, H and I were so busy chatting on the drive home that we missed our turnoff for the scenic lake route. Mere minutes later we found ourselves in front of Mutual, my favorite Seattle fish store and made a fast turn into the parking lot. We were ready for another joint cooking adventure, and I've been promoting Fish en Papillote as a fun, useful technique. That missed turnoff was perfect serendipity. The fish market was eerily empty when we arrived, offering a perfect opportunity to consult with the experts. The helpful fellows behind the Mutual counter recommended halibut, swordfish or sturgeon for parchment cooking, and chose a pair of gorgeous sturgeon steaks for us. Two pieces were more than enough for three appetites as it later turned out (see below!). The fun continued after we arrived at the house and searched the refrigerator and pantry for vegetables, sauces, aromatics, etc. to accompany the fish. Too many choices complicated the process. With so many tempting flavor combinations, why make everyone's entree the same? Well, we didn't. 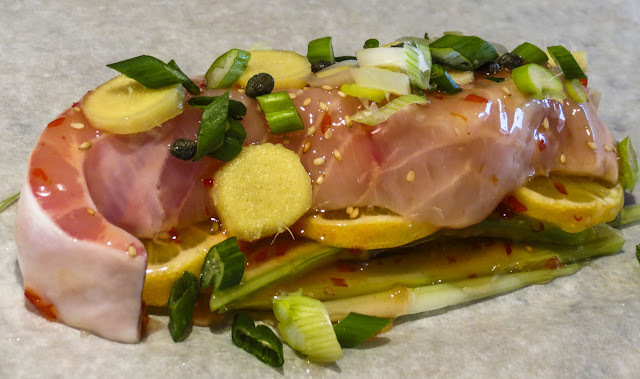 Each package began with a bed of lemon slices and a handful of julienned celery topped with 1/2 of a boned sturgeon steak. The first package featured coins of ginger, chopped scallions, lemon zest, sweet Thai chili sauce and a drizzle of mirin. 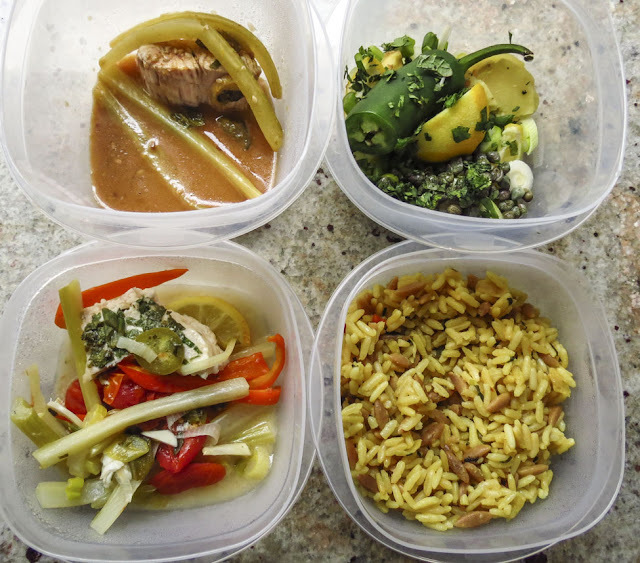 Another packet included Thai peanut sauce, jalapeno slices, scallions, ginger,lemon zest and lemon juice. 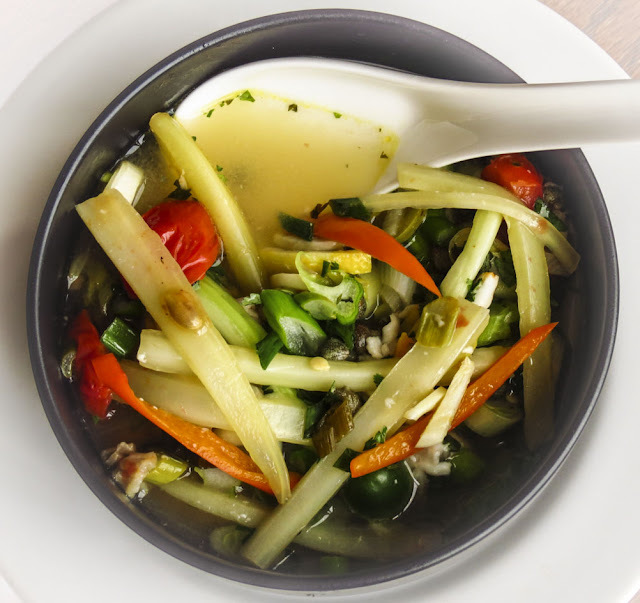 A third parcel held sweet red pepper strips, jalapeno rounds, capers, mini tomato halves, chopped fresh mint and cilantro, Ponzu sauce and a splash of mirin. There was a fourth package, but without a photo I can't recall what it contained. I do remember that all four combinations were delicious, but the peanut sauce was the favorite flavor hit. 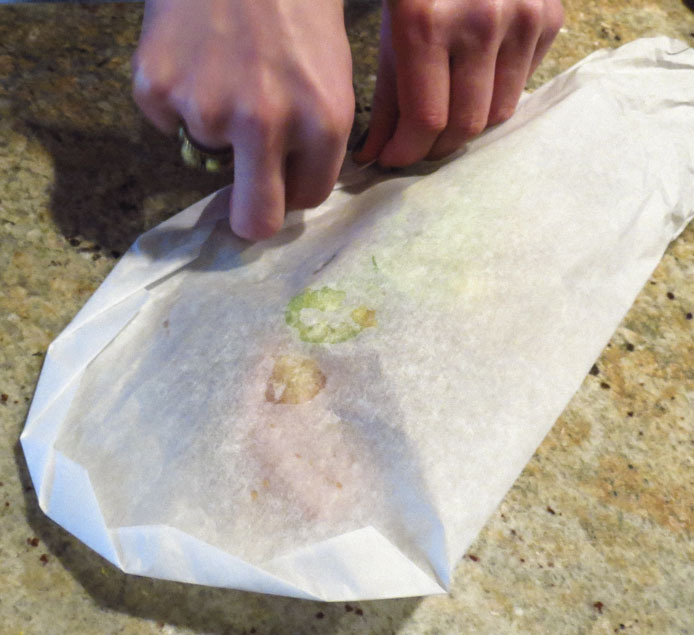 H cut parchment hearts, stacked the ingredients on one half of the paper, folded the edges to close, placed the packets on a cookie sheet, and baked them for exactly 12 minutes in a preheated 425 F oven. That's it, a complete set of directions in one sentences Note: see my previous en papillote post (link) for more words on the same topic. 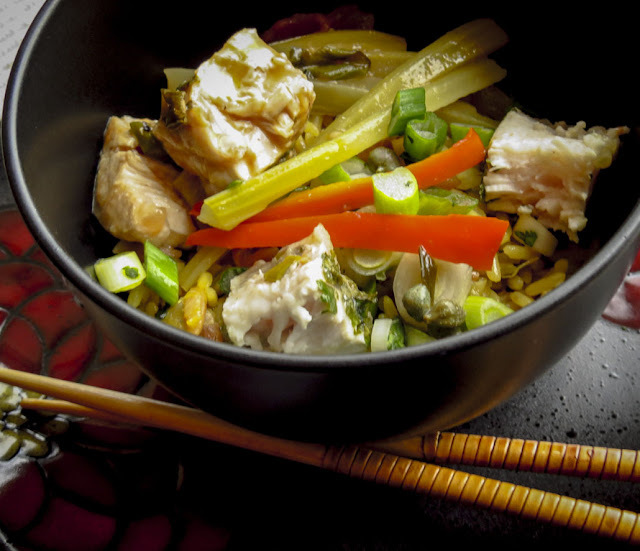 Served with a generous mound of rice, each packet made a filling entree, and that left a healthy quantity of cooked fish, amazingly tasty sauces and some fresh supporting ingredients to use in reruns. Hooray, I do love playing with leftovers to create something new for lunch the next day. Reheated gently in the microwave, this rice bowl was topped with a few chunks of sturgeon, cooked celery, fresh peppers, green onions and capers and a few drizzles of cooking sauce. This was SO good, it did not taste like leftovers. I poured a cup of steaming broth over a second loaded rice bowl combination, stirred in a dash of lime juice and fish sauce, and celebrated another winner. Once again, this did not taste like leftovers, it was scrumptious. What's in your favorite rice bowl or Asian soup? It's reveal day for Secret Recipe Club, Group B, and I can finally share a recipe from my assigned blog, BizzyBakes. Chaya's posts were peppered with nuggets of humor and presented so many tempting choices as I browsed through the Bizzy Bakes archives. Then her Muffins and Sweet and Savory links sent me off in still other directions. Eventually my recipe selection narrowed down to a choice between Little Lasagna or Pasta and Mushrooms. Shazam, inspiration flash! just combine the two recipes, tweaking them a bit to fit our tastes and the ingredients available on the boat. I think Chaya's adventurous blog character, Wonton Warrior, would approve. Visit Chaya's blog to see the original recipes. 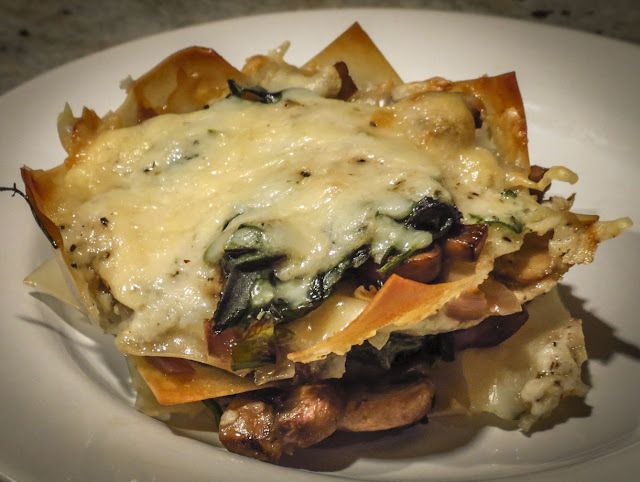 Version One, my practice round, featured layers of cooked button mushrooms, chopped white onions, shredded kale, a pinch of sage and a handful of mozzarella cheese, stacked in between squares of wonton wrappers. The resulting lasagna cupcakes were tasty enough, but more ordinary than special. RL complained about the crispy corners that made the wonton a dangerous dish to eat. Version Two really took shape with a big bag of dried chanterelle mushrooms, beauties that begged to be part of something wonderful. Those gems were a gift from a generous friend who forest-picked and dehydrated them during Fall 2012 (thanks again, Jean!). Rehydrated in a combination of beef broth and chicken broth with a touch of thyme and mint, then cooked in a bit of butter until the liquids evaporated, those mushrooms were swoon-worthy delicious! It was hard to put down the tasting spoon and save enough filling for the official dish. 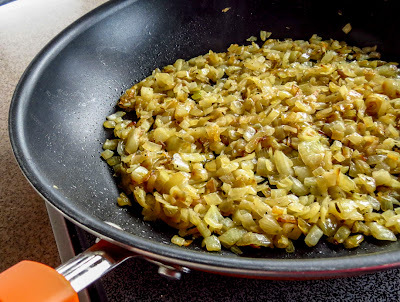 The process: Saute onions in a tablespoon each of butter and oil until softened all caramelized and golden, but not crispy brown. Remove and set aside. Sort through the dried mushrooms, remove tough stems or ugly bits as needed, and chop into large pieces. Bring equal portions of beef broth and chicken broth to a simmer; add some white pepper, dried thyme and mint and reduce heat as necessary to hold at barely-bubbling status. 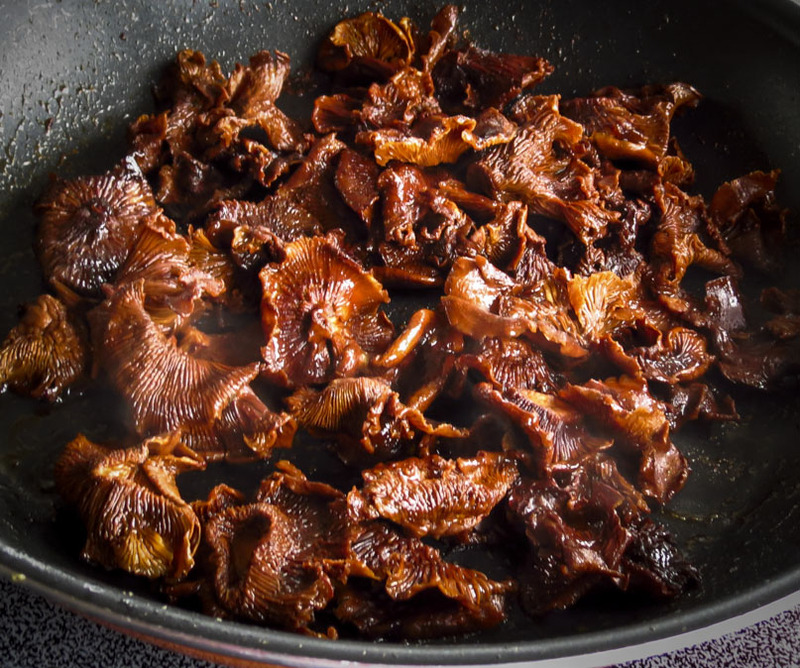 Place the dried mushrooms to the pan and simmer until softened; add butter to the pan and cook until the liquids have evaporated and the 'shrooms are golden and tasty. Remove and set aside. Use the same pan and cook pancetta or bacon until browned, done but not too crispy. Remove and set aside to drain on paper towels. Assemble your ingredients so the wonton lasagna come together quickly. I recommend using round wontons to save time and avoid those dangerous sharp, crispy edges! Parmesan and feta cheese combined for a pleasant, mild flavor, but mozzarella or any soft white cheese would be a good choice. Chopped green onions added color and one more oniony note. Butter, oil or spray each baking cup or muffin tin. Stack layers of ingredients beginning and ending with a wonton lightly sprinkled with cheese: wonton, cheese, onions, 'shrooms, pancetta, other cheese, green onion bits. Repeat this layering until you run out of stackable space or filling. Bake at 375 F for about 20 minutes, until the cheese melts and each little lasagna is warmed through with slightly browned edges. Rest on a baking rack for several minutes to allow the lasagna to firm up before removing from baking cups. Photo below: Lasagna served baked-side-up as a first course or appetizer. Photo below: Lasagna served upside-down as a softer, more fork-friendly version. Results: I love the wonton lasagna concept, but the details need work. Next time I might combine the two ingredient lists, still using chanterelles rehydrated in broth but adding some sherry or vermouth to the cooking liquid for a more complex flavor. Kale added texture and color, so its a keeper. The pancetta rounds were attractive but not fork-friendly, so they need to be diced or replaced with bacon or some crumbled sausage. Alternatively the dish could be meatless and still pop with flavor. One of the cheese choices should be readily meltable to hold the stack together, but not so runny that it pools in the bottom. Mini Wonton Lasagnas invite recipe tweaking. Substitute your favorite ingredients or play with new ones; there's little risk involved since you can begin with a small sample of one or two cups. 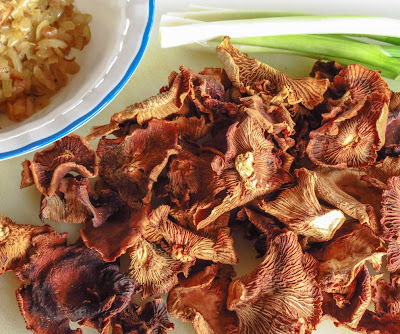 Serve them as a first course, an unusual alternative to 'shrooms in a crepe purse, or plate one or two with a green salad for a lunch entree or light supper. Thank you, Chaya and Wonton Warrior, for this recipe inspiration. 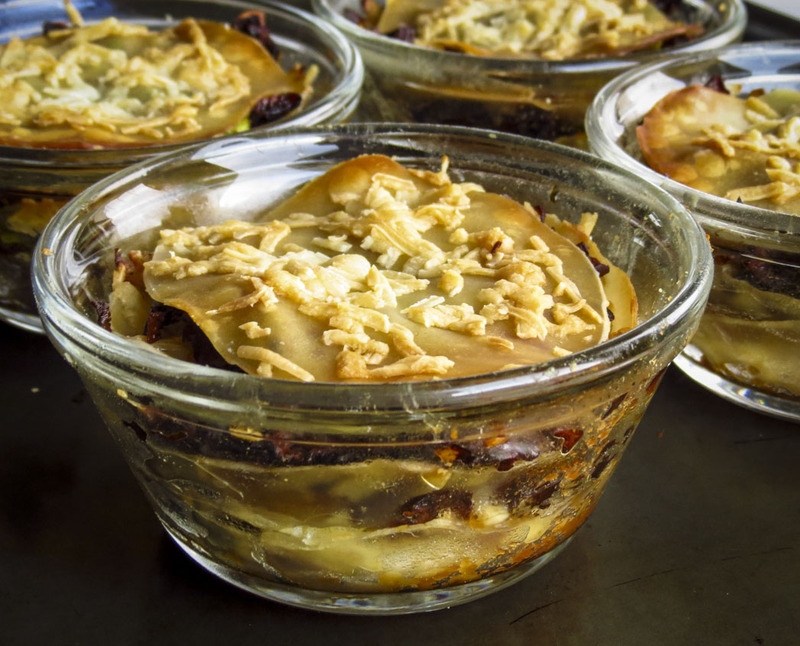 The cool February weather called for comfort food, something hearty to warm the stomach and lift the spirits, and it wouldn't hurt to make a big batch to have ready to reheat for several lunches. Red pork posole was the perfect thing to fit those needs, not that we ever need an excuse to enjoy a pot of posole. 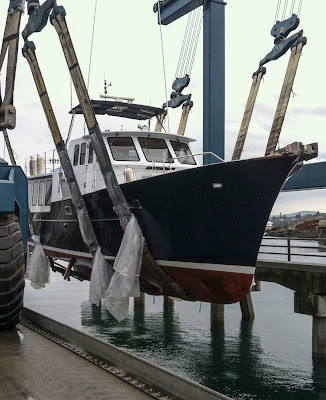 We had just moved Rhapsody south (link) to a shipyard for haulout and the days were busy with preparation. I didn't want to spend hours in the galley, fussing over a slow-cooking braise or stew, while we were busy with boat projects. I also needed to work with the ingredients already on board since the nearest grocery was miles away... uphill... in the rain... and I was lazy "otherwise occupied". 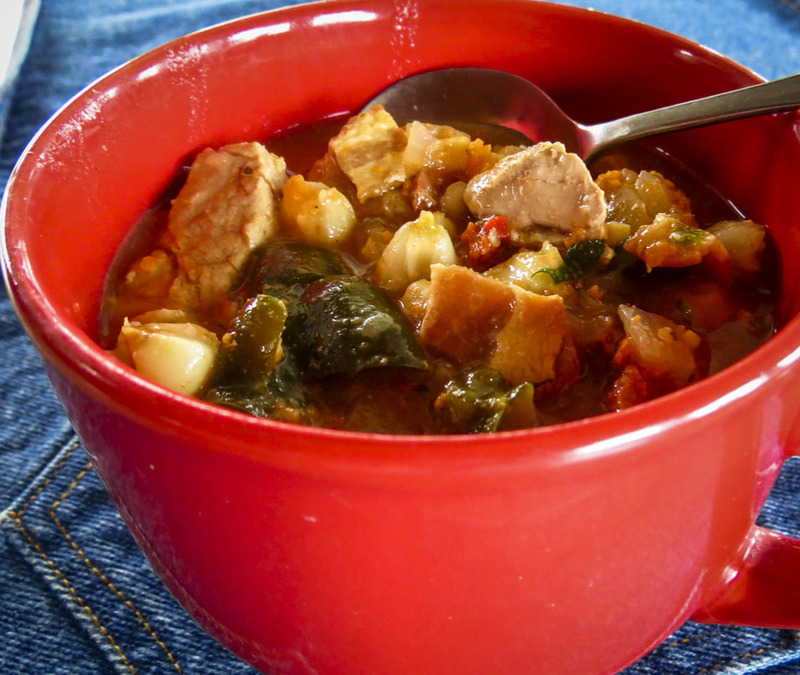 Here's the latest NW version of a Simple Sort-of Posole Soup. In a Dutch oven over medium heat, cook the bacon to render out the fat but not until crisp; remove and set aside. In the same pan, cook the chorizo till no longer pink; remove and set aside. In the same pan, sear the pork chunks in two or three batches until browned on all sides but not crispy; remove and set aside. 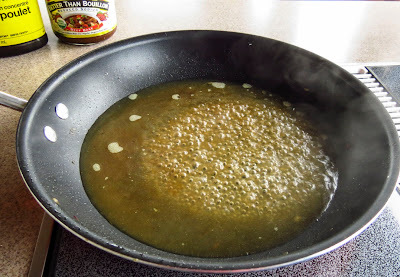 Remove all but a tablespoon or two of fat from the pan. Add the diced onions and chile pieces to the pot; saute for a few minutes until they begin to soften. Add the garlic and cook for a minute or two until fragrant. Add the dried spices and cook for a minute or two, stirring often, until fragrant. Return the meats to the pot, add tomatoes and broth and bring to a boil. Lower the heat and simmer gently until the pork is tender. Add the hominy and kale; simmer until softened and heated through, adding water if needed to keep the ingredients covered with liquid. Taste for and adjust for seasoning, add salt and pepper as desired. Stir in the juice of 1 small lime just before serving. I topped my bowl of posole with fresh cilantro. RL added two handfuls of lime-flavored tortilla chips and a lot of hot sauce to his bowl. We were both happy. Butter, flour, lemon zest -- this starts out sounding like a recipe for shortbread squares (link), but it's not. Add grated cheese instead of sugar and you have a savory treat, a wafer that's more of a cracker than a cookie. Not that I have anything against sweet shortbread cookies, good grief I've devoured pounds of them with enthusiasm, but I do have a weakness for all things savory. This particular batch of cheese wafers lasted roughly 30 hours, until I ate the last few just minutes ago. Yes, that was my 1:30 a.m. snack when I couldn't fall sleep and wandered up to the pilothouse to fire up the computer. At first bite you can taste cheese with a hint of pepper, then a surprising lemony tang comes through, just strong enough to notice but not overwhelm the tastebuds. 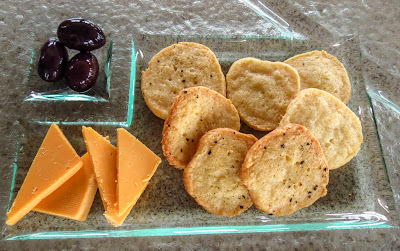 Parmesan wafers are excellent nibblies to accompany a cup of tea or a glass of wine. Served plain they are quite delicious, but I love them topped with a dab of Rosemary Flavored Jammy Wine Sauce (link) as well. This batch incorporated pre grated parmesan cheese, a Costco purchase that I had stored in the boat freezer. RL prefers a sharp cheddar cheese version of the same recipe. Guests have enjoyed blue cheese wafers topped with mango chutney. 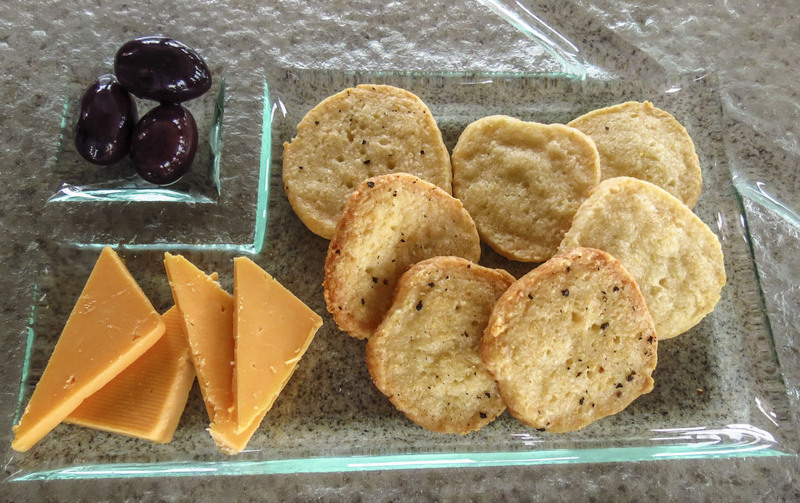 Pepper jack with a hit of pimenton is another tempting option. 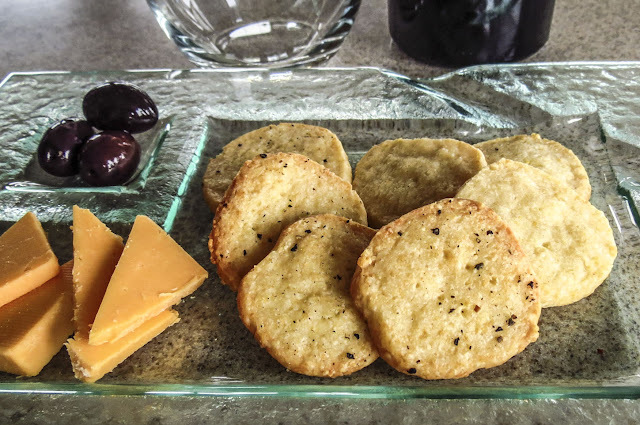 Cheese wafers are versatile and delicious, require few ingredients and come together quickly - so what are you waiting for? Bake a batch soon. In a bowl of a food processor add the Parmesan, flour, chunks of cold butter, lemon zest and black pepper. Pulse until the mixture resembles coarse meal. Add the lemon juice and process until it just forms a dough. Preheat the oven to 375°F. Cut the dough into slices, 1/4-inch-thick or thinner. Arrange the slices 1 inch apart on baking sheets, sprinkle them with the additional pepper and bake them in batches in the upper third of the oven for 10 minutes, or until golden around the edges. Transfer the crackers carefully with a spatula to a rack and let them cool. They will firm up a bit as they cool, so don't overbake. Lasagna and Wonton Wrappers? What? These little cuties are so far removed from a typical heavy, layered lasagna casserole that they deserve their own name. I tried to come up with a clever, original label, but failed. So, they remain lasagna somethings - lasagna minis? lasagna cupcakes? lasagna muffins? little lasagnas? lasagna bites? stacks of stuff? 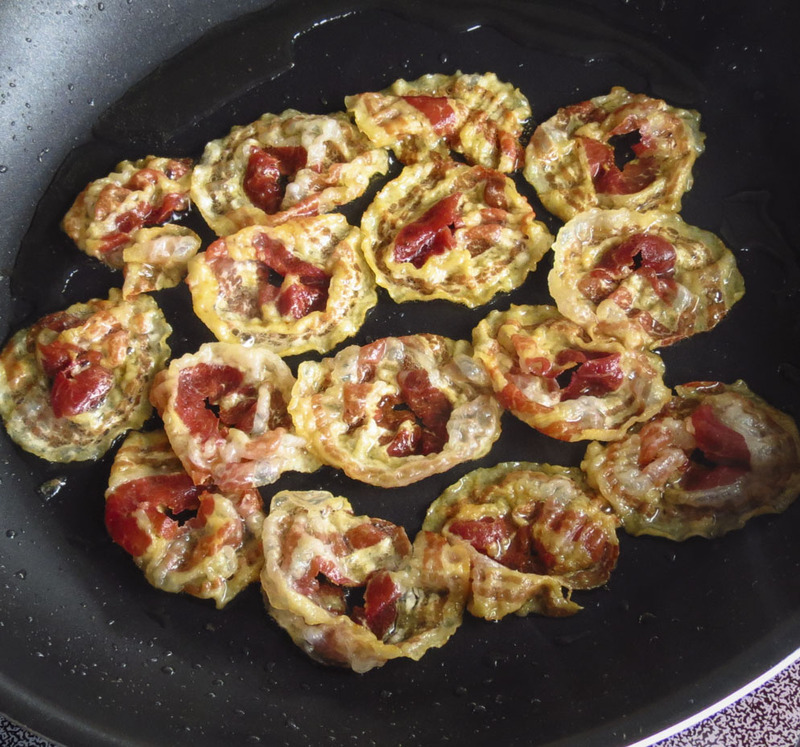 Whatever, just think of them as individual portions of your favorite layered pasta dish, lightened up and oh! so versatile. 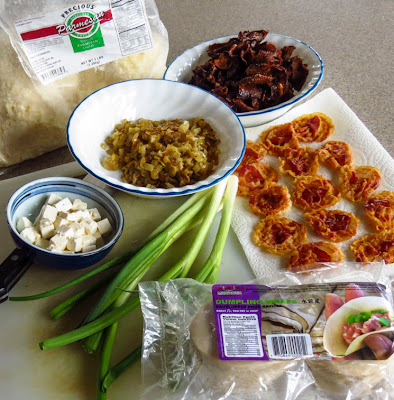 Oven-baked wonton wrappers do make novel containers for dips and spreads (link), but their hard, brittle edges can be dangerous to unwary nibblers. I feature them occasionally for Happy Hour appetizers, but don't bother with them for family snacks. 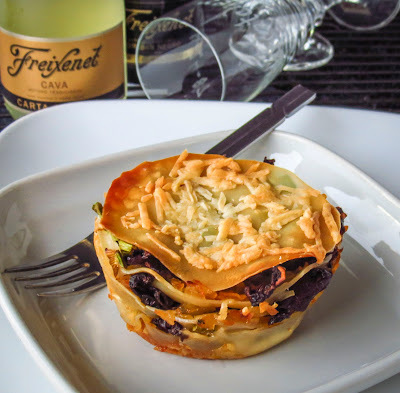 So much for history: sound the trumpets, this week layered wonton mini casseroles/cupcakes have moved onto my list of Favorite Things. 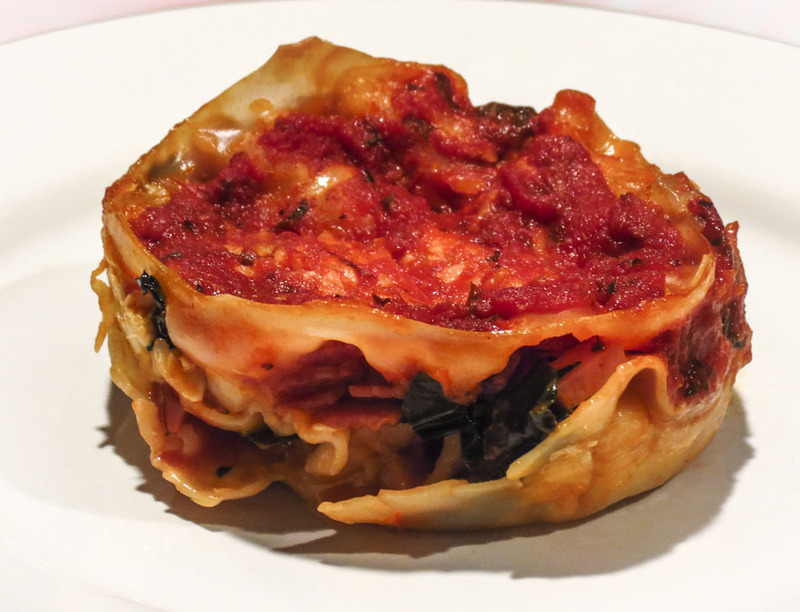 Version One began with a fairly standard lasagna with three layers of red meat sauce, several white cheeses, cooked kale and trimmed wonton wrappers instead of pasta noodles. Baked in large muffin tins at 375 F. for 20 minutes, then cooled for 5 minutes to firm up a bit (and to avoid scorching my mouth), these were easy to plate and quick to disappear. We filled up on two cupcakes apiece for dinner and polished off the remaining two for lunch the next day. Mmmmm, delicious both days; filling but not too heavy and greasy. Version Two featured layered cooked kale, caramelized onions and roasted sweet peppers, stronger cheeses, a scattering of cooked and crumbled chorizo and dabs of oregano/pimenton-flavored Bechamel sauce. OMG, this was good; yet another tasty wonton cupcake/casserole, even without the traditional red sauce. 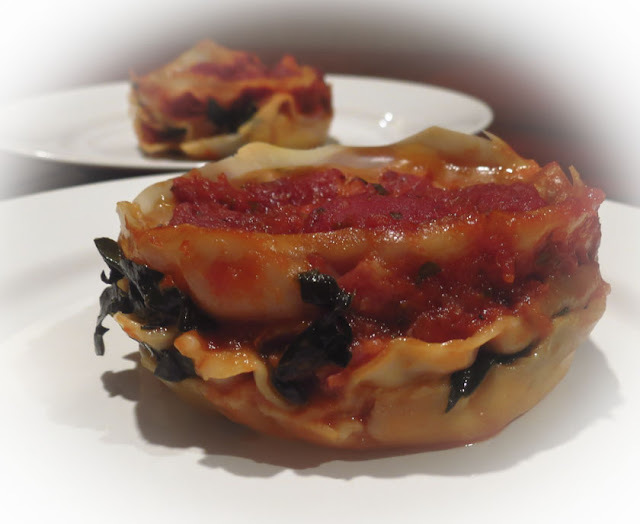 Why make Lasagna Wonton Cupcakes? After all, it takes an extra few minutes to trim the square wrappers into circles to avoid hard, crispy points. Well... they were pretty cute, portion control was easy, served plates are more attractive when sauce doesn't run all over, and individual cupcakes freeze well and can be made ahead. These are positive features, but it was really all about the taste. These little lasagna cuties were really good eats! Here's a link to the recipe that caught my attention last week. 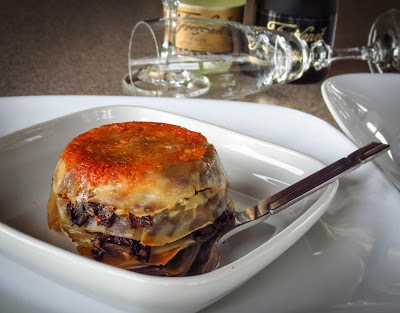 A Yummly page (link) has photos and links to several food.com recipes for lasagna cupcakes. Tumblr has a colorful page of photos and links as well. Or better yet, create your own recipe and let me know what you come up with. I'm ready to try a few more variations.